Hey everyone. No blog yesterday because my wife Courtney, HABOTN director of employee relations, said I needed to take a day away. I acquiesced as any good husband would. Anything that needed to be said yesterday can be said below. Look at Ben Tate (right) promoting No. 6, reserve cornerback Walt McFadden, for the Thorpe Award. I guess that's what Tommy Tuberville means when he says Auburn is a big family. We're available if West Virginia wants us; We're the HOTTEST Auburn blog on the 'net. It sounds like TB Mario Fannin is at least moonlighting at slot receiver now. If you recall, he spent some time out there early in his college career and rolled out in there in motion a few times against Georgia and Alabama. 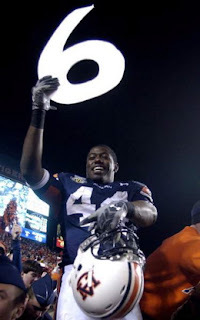 Since Auburn ditched Jerrel Jernigan, I guess the best thing to do is find your own Jernigan and use him the same way. Auburn picked up a commitment TODAY (Monday) from WR Marcus Jemison of suburban Birmingham. He was known as a quarterback at McAdory High, but will play defensive back at Auburn. He picked the Tigers over Clemson and Arkansas. As predicted in this here blog a few days ago, Auburn has received a commitment from junior college quarterback Chris Todd. He was a hot-shot prep quarterback and a good prospect at Texas Tech in 2005 and '06. Todd spent the 2007 season at a Kansas junior college. His numbers in Kansas were terrible. The company line here is that Todd wasn't a good fit for that offense (obviously) and will produce at a much higher level under offensive coordinator Tony Franklin. Auburn also landed a commitment from former LSU signee Charles Deas, a large defensive tackle. He spent the fall at the same New York prep school that Bo Harris attended a year earlier. Deas is a big man. Not Greg Smith, but bigger than anybody Auburn has right now. Pat Sims is a reasonably close comparison. Deas will have four full seasons of eligibility. Brandon Cox isn't exactly geeked about what happened to offensive coordinator Al Borges, who was pushed to resign last week. I feel for Cox: Sixth-year senior preparing for his final college game as a new offensive coordinator installs a completely new system that doesn't match Cox's skill set. Tuberville said last week that "this is Brandon Cox's game," but surely Kodi Burns will run some of this new stuff in Atlanta. Right? Four football players, three on the current roster, walked at graduation today. Center Jason Bosley, offensive tackle King Dunlap, fullback Danny Perry and former long snapper Pete Compton became college graduates on Monday. Also of note: former baseball player Cory Dueitt earned his degree today after participating in the athletic department's "Operation Follow Through" program. He was a senior in 2004. Not that my opinion on this issue matters, but going back to school is a noble endeavor. Dueitt gets official propers from the entire HABOTN family. This has nothing to do with baseball, but Alex Rodriguez's proclamation that he ignored agent Scott Boras in his recent negotiations with New York intrigued me. Agents have become too powerful and too much of a spectacle, Boras in particular, and it's cool to see an agent get owned like this. I'll have more respect for Rodriguez if he dumps Boras altogether. I can't believe a rift like this even gets out. As Tuberville might say, it demonstrates who has leverage in that relationship.